As I sit in a class that explores the indefinite definition of American “independent” cinema in my senior year at Wesleyan University, my mind is on a post-college real world that is rigidly defined by expectations and responsibilities. How can I fit my passion for art and creativity into this new environment? Is trying to do so a waste of valuable time? I have many anxieties as an un-established artist, but vicariously engaging with Jini Dellaccio through Her Aim is True has helped them subside. Her Aim is True details the story of Jini Dellaccio, a fashion and rock photographer whose body of work spans decades, although hers is a largely unknown archive. A bona fide artist, Jini is everything that I have studied, and everything that any creative-minded individual hopes to be. As I whittle away my hours as a college student watching Barbara Kopple’s Harlan County, U.S.A. and a host of other culturally significant works, I come closer and closer to the reason I devoted my undergraduate career to liberal arts and to the study of film in particular. Though my next step is unclear, the films I have seen have taught me the power and importance of art as historical record. I realize that I am where I am right now because photographic and cinematic art matters. 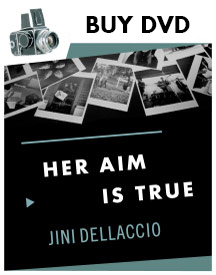 Jini Dellaccio matters, and the record of her story, Her Aim is True, matters. Photography and documentary preserve the emotional conditions of the past. Though I am sure it upsets my mother, it is a fact worth stating that the 1960s were 50 years ago. Despite this long passage of time, there are individuals of my generation (I’m 21) and many still younger who feel as though they know what the 1960s were all about. We get the fun, we get the exhaustion, and we imagine that we remember the uncertainty of the youth as if it were our own. Somehow, we think we understand what Roger Daltry is saying when he’s just talkin’ about his generation. It’s not simply because we hear him, and it has nothing to do with seeing these bands live today. It is the combination of sound and image (music and photography) that continues to communicate the cultural catharsis that was rock and roll in the 1960s. Posterity will always know the ennui in Mick Jagger’s eyes, the blood on Pete Townshend’s knuckles, and the shadow-casting fringes of Neil Young’s (and Daltry’s) jacket. It will remember the antecedents of punk and grunge as the raw, unpretentious sound of The Sonics and The Wailers. The future will retain the significance of the past because the synergy of photography and music is so clear; so emotionally legible. This circumstance is predicated on the work of Jini Dellaccio, and it will persist with efforts analogous to those of filmmaker Karen Whitehead, curating Jini’s impressive wit and amazing body of work in documentary form for all to see. As a young person entering the vast and nebulous industry of artistic endeavors, I am glad to have found Jini Dellaccio’s story and Her Aim is True. The film is a great testament to the importance of presence in your own time and consciousness of the past (with a really cool soundtrack).